I love, love, love The Writer’s Almanac. I listened to several podcasts in a row on the way home yesterday, sometimes paying attention, sometimes just letting Garrison Keillor’s voice wash over me without trying to focus on what he was saying so much as how he said it. One quote, however, jumped out at me, and I wanted to share it here. I’ve personally balked against the “write what you know” idea for some time, partially because the only things I know seem mundane and commonplace and who wants to read about anything that can be described in those terms? Really though, writing, for me, isn’t about what I write – it’s about what I learn from what I’ve written. More often than not, my writing is full of questions. Perhaps not so much here, but my more personal writing, my raw and unpolished and unpretty writing, almost always pleads for a new level of understanding, a moment of clarity, an epiphany. And sometimes, I even get it – through a process that begins with putting the questions down on paper. Certainly the revelations don’t always come right away, but often enough they jump out at me upon revisiting the piece a week, a month, a year later. So am I writing about what interests me? I guess I am – I’m interested in answers. To everything. All the time. As book bloggers, we’re all readers, sure, but we’re writers, too. What are your thoughts on the above quote? Do you have a favorite quote about writing? Am just under a hundred pages into The Time Travelers; will return to it later, but need a break from the story and have seen so many Twitter updates about The Hunger Games that I’m going to give that a re-read. I’d pulled Battle Royale, which has a similar premise, as a possible book for the readathon, but I know it’ll take up several hours’ worth of reading at a fast clip. I’d rather hold off and give that one a luxurious read (if one can say that about a gruesome and psychopathic book). Just got out of the shower; think it helped lift my lids a bit so I shouldn’t start flagging again for a while. Am trying to avoid coffee, but may have to indulge this afternoon. All it means is that once the caffeine starts really flowing, I have to keep it up, right? I can do that. :) Anyway, back to it – hope everyone is making great progress and having fun! OK, we’re entering the sixth hour, and I am feeling like a SLACKER! I’ve finished E. L. Konigsburg’s From the Mixed-Up Files of Mrs. Basil E. Frankweiler, started Stephen Lawton’s Hood but ditched it after four chapters because it just felt too historical-fiction-y for me (I have a desperately hard time keeping track of all those rulers and lands and alliances), and am beginning The Time Travelers by Linda Buckley-Archer. I also have The Time Thief if this proves to be a winner. Would love to hear anyone else’s progress – drop a link to your own update post here, or come follow me on Twitter – http://twitter.com/aglaia531 – and I’ll follow ya back to keep up :) Happy reading, everyone, and thank you so much to the hosts and cheerleaders; you all are making this so much fun! So my book selection for the readathon isn’t very varied as far as genre and reading levels go, but I think I’ve got a good chance of getting through quite a bit if the books are as good as I’ve heard they are. 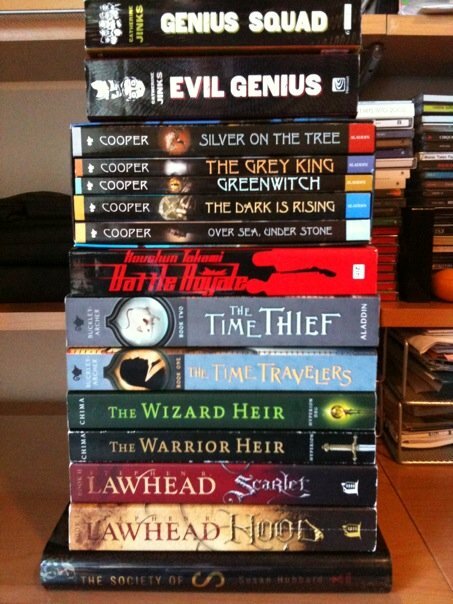 Nearly all of these have been highly praised on LibraryThing, and the only re-read on the stack is Takami’s Battle Royale. I’m also a little under a hundred pages into John Grisham’s The Associate, and have the Harry Potter books on standby if I just can’t get into anything at any point. Given that (a) I’m not on my own computer, so the absence of my LibraryThing cache and the presence of a new-to-me browser would slow me down, and (b) I heart my iPhone, I’ll be using Twitter and/or Facebook to update along the way. I’m going to unlock my Twitter account (aglaia531) for the readathon, and will add you on Facebook (Kirsten Griffith) if you state in a message sent with your friend request that you’re along for the readathon ride. And on that note, I’m going to veg with my kitties and some NCIS before getting a few hours of sleep to prepare for the big event! I’ve been hesitant to commit to Dewey’s read-a-thon, primarily because my life has been so crazy that I can hardly find a solid hour, let alone twenty-four of them, to dedicate to reading. However, the timing has worked out so that I will be house-and-cat-sitting and therefore unable to make progress on my own unpacking and settling project, so what better excuse? 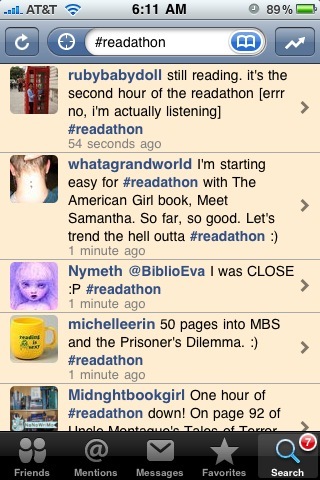 Are you participating in the read-a-thon? Is it your first time, or are you a veteran? Got any tips for a last-minute newbie? From Tutu’s Two Cents, a blog I started reading because of our geographical connection; she’s a Mainer, and I’m a former Maine…. resident. :) I like the idea of choosing a random book to single out, as I often forget the answers to the very questions she asks about the title highlighted by the random generator for this weekly. if not, do you plan to read it? My LibraryThing catalog view is set to 100 books per page, so I first chose a page (5) and then a book on that page (55) and came up with… Loser, by Jerry Spinelli; paperback, 224 pages, YA fiction. My review (which is brief because, well, you all know I hate writing reviews): This book had me in gasping, gut-wrenching sobs for the first half, and wondrous contemplation for the second. A simple, swift read, but one that brilliantly captures the soul of a child as he leaves the emotional safety of a loving home and comes in contact with the world around him, its cruelties immense and looming. I wish I could remember where I got the recommendation; I really need to start using the private comments in LT for that. At any rate, I loved Spinelli’s prose, was absolutely enamored of Donald (the protagonist), and will certainly be reading more by this author (have already purchased Stargirl but – say it with me, now – haven’t gotten to it yet).